Namaste! We see the light in you. You are looking at a spiritually-focused yoga teacher training in a very quiet countryside location away from noise, distraction, the busyness and stress of towns and the city. There will be lots of pranayama and meditation practice along with asana and the key focus on yoga philosophy. This is a 25-day 200hr Yoga Teacher Training course that will give you the possibility to register to Yoga Alliance. The location is in a family-run property in rural France, a 17th-century manor house with views of rolling hills, 6 acres of private grounds, a little wood at the edge of the property that leads to a lake reservoir. Rooms are comfortable and based on either 3 or 4 sharing, each has a reading light and private locker for valuables (we ask our guests to bring a small lock) We also have a cozy single room with shared bathroom, additional upgrade. There are two lounge areas for relaxation and quiet time to study or read when not outdoors enjoying the grounds or yoga deck. We have two spaces dedicated to yoga - an indoor hall and an outdoor deck for long sunny French summer days with rooms decorated in French vintage style and 6 acres of private land and garden. The location is rural France which is very tranquil and peaceful, away from towns and noise. If you wish to do some touristic activities and see some attractions, please plan these before or after the training. The remaining 20 hours are further reading after the course and preparation before the course. I have no strict guidelines for these hours, but I encourage you to continue studying on topics that you found interesting during the course. The RainbowLight Yoga programme is a spiritually focused course with emphasis on yoga philosophy, practice, and meditation. Our anatomy section is mainly on inner-body anatomy (chakras and nadis / energy body). If you do not yet have a regular meditation practice yet, please start now (about 7-10 minutes a day for beginners, 10-20minutes a day for progressing students). Please also note that meals provided during the course is based on a vegetarian diet. There will be days off on Saturdays. Please note we are not close to a village or town, so if you are planning to explore the country, please make your touristic and sight-seeing travel plans before of after the training. Sun­shine has been teach­ing yoga for more than 13 years and is reg­is­tered with Yoga Alliance as eRYT-​200, RYT500 Level 3 Yoga Teacher on the Reg­is­ter of Exer­cise Pro­fes­sion­als in the UK and is an accomplished teacher trainer. She com­pleted yoga teacher train­ing in Rishikesh, in the foothills of the Himalayas under yogi Vishvketu of Akhandha Yoga and advanced training with Shir Shemesh. ​Sun­shine embarked on a for­mal study of Tibetan Bud­dhism and com­pleted the Asian Clas­sics Insi­tute 18 courses. The 18 ACI courses con­dense the essence of the Six Great Books of Bud­dhism. A 17th century manor house at the edge of a small quiet village in South West of France view views of rolling hills, with 6 acres of private land and garden, woods at the edge of the property that leads to a lake reservoir. View the Pyrenees on a special sunny day. You will be served vegetarian and vegan breakfast, lunch and dinner, we are able to cater for gluten free diets. Take a bicycle ride along the quiet country lanes, free bike rental, walk and explore 6 acres of private land to the woods at the edge of the property that leads to a lake reservoir. From any airport in France, take the train to Mont-de Marsan and the organizer can arrange pick-up and drop off from Mont de Marsan station for 30 EUR two way. 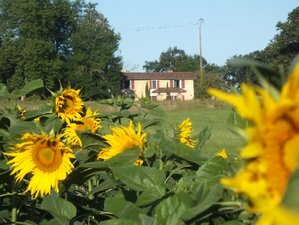 Hunting Lodge France is a beautiful 17th-century manor house at the edge of a village in the middle of the quiet countryside of South West France offering yoga teacher training. Enjoy a massive discount when you make a booking for May 4, 2019. Shared lodge - Flash sale!